This is even true for “water based” lubricants that you might think are safer. There is, however, a lubricant on the market right now that is designed to be “sperm friendly” and does not damage, hurt or kill sperm in any way. 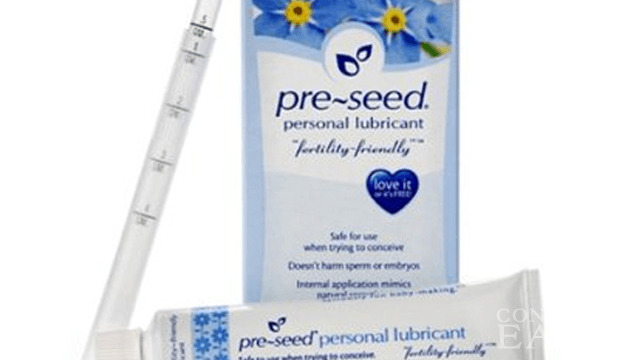 That lubricant is called PreSeed, and its popularity is growing fast. Everyone is talking about PreSeed, as it is a very revolutionary product. It is the first lubricant that is specifically designed to be sperm friendly. PreSeed touts its product as the first ever lubricant to be safe for couples who are trying to conceive. PreSeed was designed by a female sperm physiologist, and it is designed to mimic a woman’s own natural fluids. PreSeed comes with its own applicators so that you can deposit the lubricant inside where it is needed, and it is designed to mimic the natural cervical mucus. It is designed specifically for couples who are trying to conceive, so that it is not harmful to sperm in any way. You would be surprised to see all of the name brand commonly used lubricants that have been proven to be harmful to sperm. You can find PreSeed online, or at a local drugstore like CVS or Walgreens. It is actually pretty affordable and definitely worth a shot if you are someone who needs lubrication but also wants to conceive and is afraid of what regular lubricants can do to sperm. PreSeed has a lot of loyal fans, and a lot of moms who say it is the only thing that helped them to get pregnant. Just go to their site and read their reader testimonials to be inspired. It is very inexpensive and I would say that is definitely worth a try if you are having trouble conceiving. It is not harmful to you or your man’s sperm in any way, so you might as well give it a shot. If you are still concerned about using PreSeed, ask your doctor or health care professional what their opinion of PreSeed is so you can get a green light from them.